Children’s books have made for some of our very favorite films, including The Wizard of Oz, Willy Wonka and the Chocolate Factory and The Jungle Book. Two very different books, Judith Viorst’s classic Alexander and the Terrible, Horrible, No-Good, Very Bad Day and Alan Snow’s Here Be Monsters! (The Boxtrolls) both have new film adaptations. In Alexander, a boy must cope with a disastrous day where absolutely everything goes wrong and in The Boxtrolls, a boy raised by the hated trolls must learn to stand up for them and for himself. Here are some of the best stories that adults love as much, or even more, than the children they were originally written for. Frank L. Baum’s books about Oz have been interpreted many, many ways since The Wonderful Wizard of Oz was first published in 1900, but the 1939 MGM musical remains the best-known and best-loved incarnation of Dorothy and her adventures in the magical land of Oz. This gloriously psychedelic adaptation of Roald Dahl’s Charlie and the Chocolate Factory was a box-office flop when it first came out, but has since grown into a treasured cult classic. Tim Burton’s remake, starring Johnny Depp as the eccentric candy maker, couldn’t rival the ’70s film and the perfection of Gene Wilder as Wonka. For more great films based on Dahl’s novels, check out Fantastic Mr. Fox (2009) and The Witches (1990). The 1968 novel by British Poet Laureate Ted Hughes was adapted and transported to America with its Cold War paranoia intact in the marvelously underrated 1999 film. Director Brad Bird would go on to helm The Incredibles for Pixar, but, for many fans, The Iron Giant has even more heart and an even greater message: You can choose who you want to be. The classic 1905 novel about young Sara Crewe–who goes from wealth and privilege to virtual slavery–was already a popular 1939 black-and-white movie version with Shirley Temple. But the ’90s film, directed by Alfonso Cuaron, made the most of its rich color palette, infused with gorgeously surreal glimpses of India, where Sara spent her happy childhood. The much-loved 1941 novel by Walter Farley became a beautiful, heartfelt screen tribute to the bond between a boy and a prized Arab racehorse in this 1979 film, which was nominated for two Oscars, including one for the late Mickey Rooney. Disney’s musical version of Rudyard Kipling’s classic jungle tale is obviously a far cry from the book, but it’s still a great celebration of Kipling’s characters and a fantastic introduction to the writer’s works. 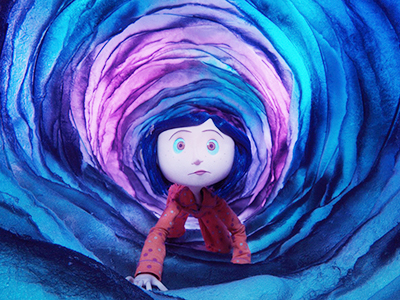 Neil Gaiman’s award-winning 2002 fantasy novel was adapted into an Oscar-nominated animated film from Henry Selick, the director of The Nightmare Before Christmas. The story—about a young girl whose wish for a more loving and attentive mother comes true in a parallel universe where the “Other Mother” with button eyes seems to be everything she ever wanted—has been compared to the classic Alice in Wonderland. One of the best-loved and best-selling children’s novels of all time (written in 1952 by E.B. White), came to the big screen in 1973. The animated film boasted songs written by the Sherman Brothers, the songwriting duo of Mary Poppins and The Jungle Book fame. Like the book, the movie inspired generations of animal lovers and vegetarians. Of course, you may prefer the live-action version from 2006. Based on the fantasy novel by German author Michael Ende (which was translated into English in 1983), the 1984 film yielded two sequels, but the first one, starring Barret Oliver and Noah Hathaway, is the ones fans remember best. The 1972 novel by Mary Rodgers had already been made into a film starring Jodie Foster as the teen who accidentally trades bodies with he mother, but the version with Lindsay Lohan and Jamie Lee Curtis is our favorite. Curtis is utterly believable as a teenager making the most out of being in her mom’s shoes for a day. The beloved 1945 E.B. White novel about a talking mouse got a lovingly faithful adaptation with great effects and a well-chosen cast, including Michael J. Fox as the voice of Stuart, Hugh Laurie and Geena Davis as Mr. and Mrs. Little and Nathan Lane as Stuart’s nemesis, Snowbell the cat. Spike Jonze gave us one of the most creative takes on a classic children’s novel by showing Max’s complicated real life before plunging us into the fantasy, beast-filled jungle of Maurice Sendak’s cherished 1963 story. It might be more geared towards adults, but it still speaks to the child in all of us. 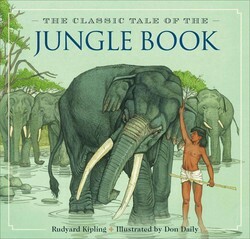 For the first time in over a decade, Don Daily’s original illustrations of The Jungle Book are brought back to life with unprecedented quality, accompanied by Rudyard Kipling’s timeless and enchanting stories of the jungle.When Rudyard Kipling wrote The Jungle Book nearly 120 years ago, he used his imagination and experiences in the Indian forest to create a majestic domain where animals formed their own societies. In 1993, Don Daily brought the jungle to life with beautiful illustrations detailing the worlds of Mowgli, Baloo, Kaa, Bagheera and other jungle dwellers. The stories teaching morals, self-discovery, loyalty and friendship are revived like never before.